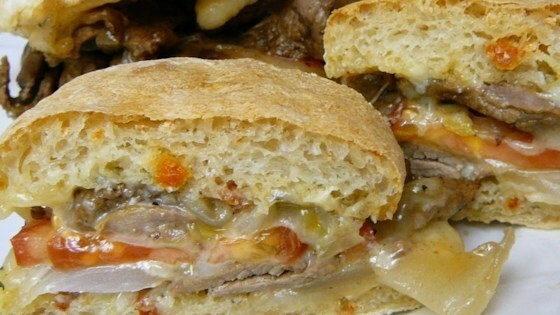 "Make the ultimate steak sandwich with tender and juicy steak and sauteed onions served on a toasted hard roll with garlic-Parmesan mayonnaise, provolone cheese and Italian seasoning. Don't forget to roll up your sleeves!" Generously spread the prepared garlic-Parmesan mayonnaise on both halves of the toasted rolls. Divide the steak and onion mixture evenly among the bottom halves of the rolls, piling them high. Top each with 2 slices provolone cheese and sprinkle with Italian seasoning. Place the tops on the sandwiches. Wow! That was way too garlic-y. No thank you. 10 minutes was a bit long for that thin meat too. Definitely searching for another steak sandwich. The garlic parm mayo makes this sandwich. This recipe was delicious. I purchased thin sliced round steak from my butcher, but still found the meat to be tough. Next time I might pound the round steak first. Overall a great recipe!